Jimmy Fallon is truly the king of entertainment. He ropes in the recently married Brad Pitt for a dance-off on his show. 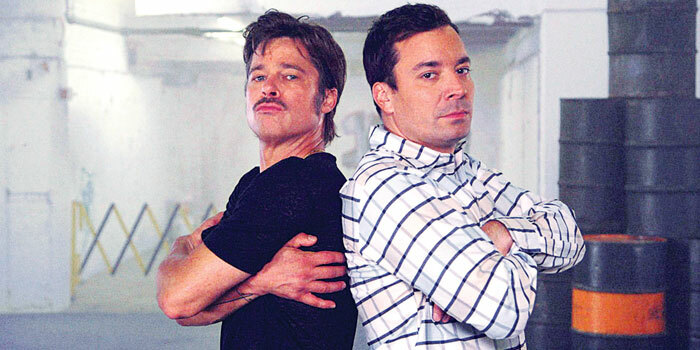 The actor, while unable to be on the show, appears in a sketch alongside two professional break dancers who are made to look like Fallon and Pitt. They then have a conversation while busting moves. This hilarious video is the sequel to the clip in which the two entertainers yodel to each other! You can count on CineFix to rescue you with the ideal video parody. With Halloween around the corner, the channel has squeezed in all 10 films of the Halloween series into a short video. The animation starts at the 1978 film before taking things through to the 20 years hence film and summarises them all in two minutes. Relive Jamie Lee Curtisa�� inexplicable return from the dead in this entertaining parody which sets the mood for Halloween. In 2001, hip-hop singer Afroman made Because I Got High. It was a comedic approach to those who used drugs and saw most users classified as failures. He returns now, in collaboration with the National Organization for the Reform of Marijuana Laws, and demystifies the culture by creating lyrics that tell of the side effects and health troubles of abuse. The reformed song retains the singera��s swag, making it as fun to listen to.